That’s the sound of my neighbor’s rooster. I first heard it in the middle of April and wondered what kind of animal made that sound. It took about 5 days for me to realize it was a bird, but I only learned a couple of weeks ago that it was a rooster. Because of our proximity to Ernest Debs Regional Park, I assumed it was some kind of wild bird I had never heard before. I had considered tracking down the sound so I could take a photo of a beautiful laughing bird. Coincidentally, the day we planned to visit the Audubon Society is the day I learned it was a rooster. I called it the Laughing Chicken. The kids who’s conversation I recounted dubbed it Roostyena…you know, a cross between a rooster and a hyena. The rooster now imitates the crows and the pigeons. This morning the kids were fighting over a new name: Roostigeoncrow or Croostigeon. Ha ha! The rooster at my dad’s house crowed the beginning of the theme to The Odd Couple. I always found it unsatisfying that he never finished the stanza before starting over again. For my older two part of their kindergarten science project was to hatch eggs. All sorts of eggs were bought and the kritters were hatched in Mrs. Creeds class. Come spring break the various critters needed a home. I dodged that bullet with my daughter…our youngest was just born and might get sick. My oldest son convinced me he was ready for a pet and I agreed to let him have a chick. I signed off the note. My daughter ever the jealous and devious one convinced Mrs Creed she was to have one and I made a mistake on the note. 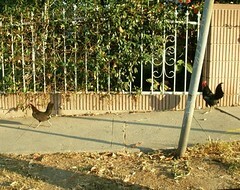 I picked them up at their afterschool program to find I was not giving a home to 2 chickens. Things went well, they got bigger, and bigger and bigger. Eventually they would get out on their own. Very frustrating. One Day my oldest decided they needed to go for a walk. She made nooses out of yarn and had enough extra for leashes. I’m in the house changing the youngest and I hear this racket and her screaming. I get outside and they are trying to walk the chickens. My middle son has a chicken that is trying to hide under a bush. Everytime it tried to leave he’d yank it hard back out from under the bush. Everytime he did that she screamed “Quit choking your chicken on the drive way”. All the neighbors were out in no time flat. It was funny and embarrassing. My friends at work reminded me that chickens are the ultimate white trash accessory. Lucky me a coyote or two got rid of them for me on sunday morning.